Long Friday - Jesus Christ‘s day - and our day - the day He had longed for, the day when our salvation should be completed. The day when the whole - the entire salvation should be finished. Two things here: Stop now quite a while for this, that Jesus has longed for the day, when your salvation should be completed - despite the infinite pain it had to cost Him. Do not proceed so soon past this - if you do, you will miss something essential. Because this does not turns on, dedication of an literary erudition, and get that in place on the paper, and in your head, but the reality in, that God so loves you, that He gave his only-begotten Son, so that you by faith in Him, might not perish, but have everlasting life. He bore you in mind, and He bears you in mind. It is namely Him whom comes/talks (un)to you, in the message you are reading just now. The second thing is - that now, on this particular day in history, it is not only finished for Jesus Himself, but also for us - it is our salvation which is completed here. Here is not only the gateway to rest, but here is it itself! 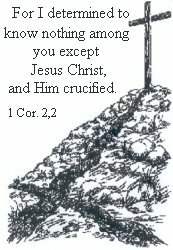 Not that peculiar then - viewed in the light of - that this day in the English-speaking countries, is called "Good Friday." (NB! In Norway called Long Friday). The texts of this day are going from Gethsemane until Jesus expires on the cross. That time in Jesus‘ life, when His suffering reaches the highest point - a time full of deceit, cowardice, wickedness, sorrow, anxiety and despair - a time when one is seeing that the abyss itself, with the ruler of the abyss in front, has come in great motion – yes, assembles all its power to the definite battle, toward this one person in humanity, whom alone has the power to defeat them. Yes, defeat them once and for all, and fully, but not by the same weapons as them, but on the contrary, by letting them use their weapons against Him - and with that they went in the trap. He had namely assumed Himself - God had laid on Him - all sin and guilt of the world - so when He was punished and died because of that that absolved man. By that "the strong man" was bound, and his goods (the man) plundered from him, by the stronger. (Mat. 12:29). His (Satans) weapons was turned towards himself, and without wanting it, he had to serve Gods, and our, case! Long Friday and good Friday - they fits so very well indeed as description on this day, both. Because even if Jesus‘ heart was overwhelmed by anxiety and sorrow until death, in view of what He was facing - it was also filled with joy, like heaven, and God Himself, was full of delight, by the view of that which now should be fulfilled, namely our salvation. It should be founded an eternal, unshakable, foundation for our salvation. It is peculiar, for a person, who has acknowledged his own sin and guilt, towards, and before God, to think that heaven - yes, God Himself, rejoices because of what has caused our salvation. Yes, it is even written that "the Lord was pleased to crush Him." (Is. 53:10). And it was surely not, to crush Jesus, in itself, which pleased Him - for He is His Son! The beloved! (Mat. 3:17 and 17:5), but by this our salvation should be provided. One gets humble, and feels want to lower glance, standing towards this fact. One feels simply unworthy to such grace, and attention, from the Heavenly Father Himself. Why is He like this toward me? God is love! (1 Joh. 4:8 and 16). “He loves, therefore He loves” - you do not get any other answer on this - only "stay in my love," says Jesus. (John 15:9). It is this love you are seeing in work, not least on Good Friday - when He dies and descends in the perdition in your place. Yes think! that is what happened! And you are still living far away from Him? And still asks: How shall I be saved? Easter Morning the actual Gods sun itself is raising, and is throwing its light out over all this, which happened by the life and death of Jesus. The prophet Malachi says so: "But for you who fear My name, the sun of righteousness will rise with healing in its wings." (Mal.4:2). It can seem confusing this, that the Word of God seems to express itself in two ways about the same subject, and with that, apparently conflicting. Does not the Word of God says, that this Sun of Righteousness has risen for all human beings, even for the ungodly? (Among other places Rom.5:6), and here at Malachi reduces it to "those who respects His name." One place it is written, that He is given to a ransom for all man - but then elsewhere again, only for many - and a third place, for those who believes in Him. And The Scripture is full of this. Let us try with a simple human picture: A master has set a big table, full of savoury dishes, for the poor - but what help is it for you, if you chooses to set yourself in a corner, a long way from the table? The table was set for all, but was only to benefit for those many, who sat down there. The message of Good Friday has really got something to do with you - it is your salvation which provides here - therefore you must put your attention to it as suchlike too. - It is namely as this starts to reveal for your heart, that you is drawn to - and actually takes seat by "the table." It is the message itself which works this - it is accordingly, basically, the Lord Himself whom positioning us there. It is therefore only one single thing, which can bar out a person from the salvation - and it is not the grossly and most disgusting sins - but infidelity towards the Word! What then works, that you are going over from being among the "all," to the "many," is accordingly the message itself, where it gets to do, and accomplish, its act. The message about Him, whom, not least, on Good Friday, reveals Himself to you, as your true saviour! If God let you get days to live, you will again get to experience Good Friday, and maybe a lot of times too - but the question to you finally, is: Has it become "Good Friday" to you?